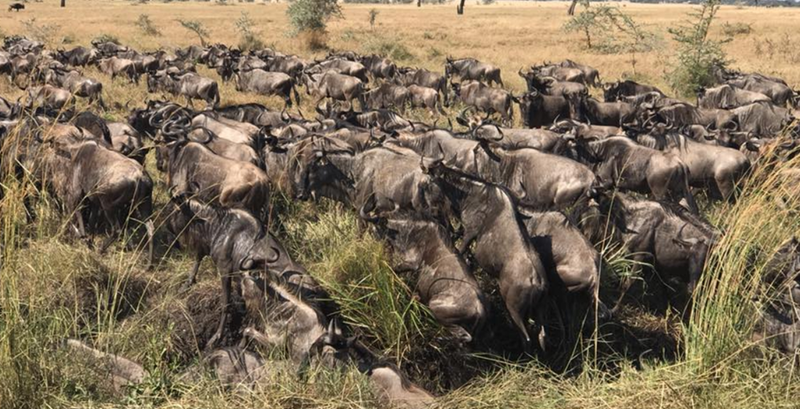 When I told my guide I wanted to see the the wildebeest migration he told me I’d see so many wildebeest I’d cry. I was up for the challenge. 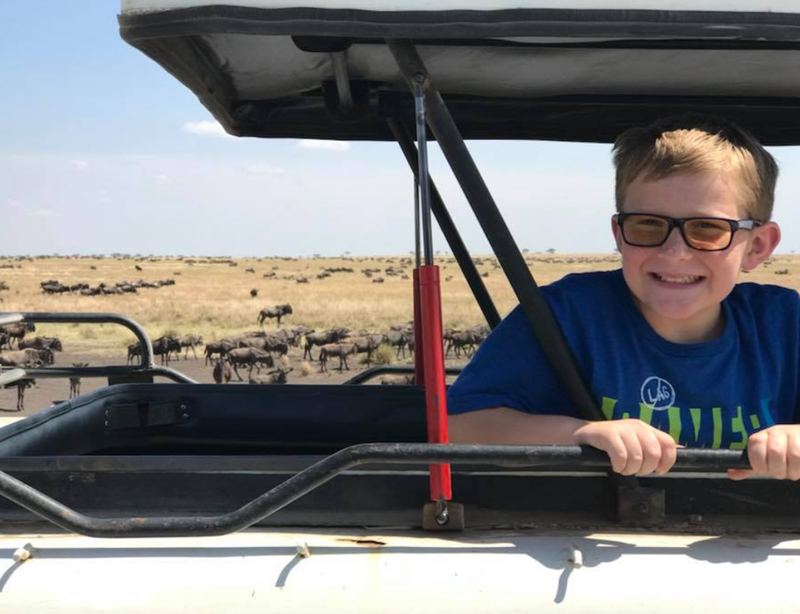 This wasn’t my first African Safari, so I knew I wasn’t going to be satisfied with a herd of a few hundred wildebeest. The family I was with was up for everything. 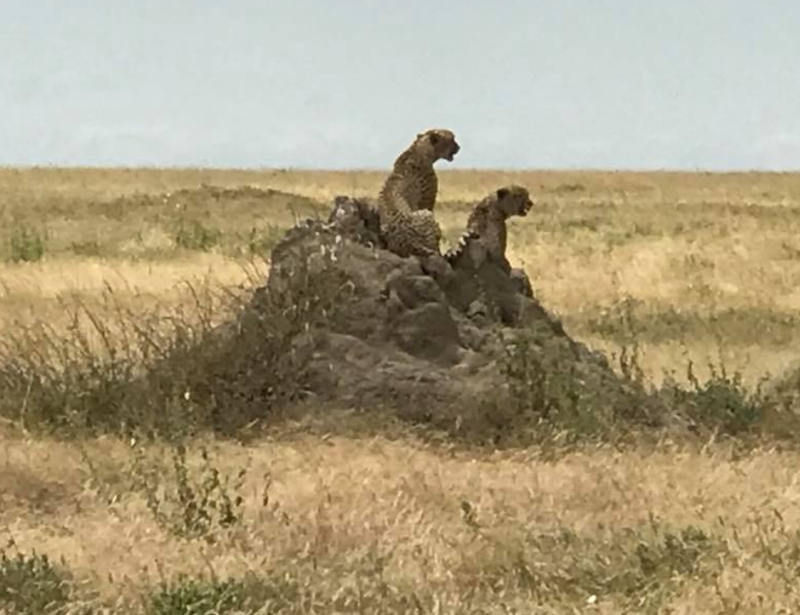 The Serengeti and the Crater is clearly the best places in the world to see the diversity of the world’s last greatest animals like the lion, cheetah, elephant, hippo, rhino and so much more. Spoiler. I got my moment. 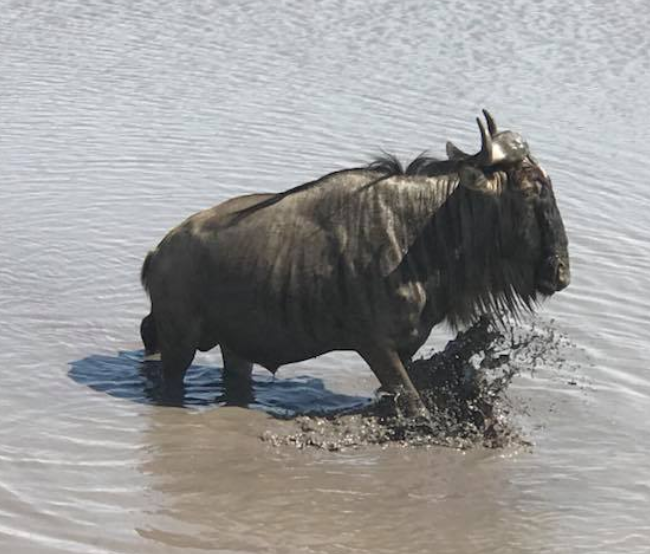 I was completely surrounded by a herd of migrating wildebeest who were climbing all over each other falling into ravines and it took me to a moment when I was in southern Utah and saw billions of crickets crawling and consuming everything in their path a mile wide. These wildebeests for a moment were the crickets and I was in that moment looking at them in god mode like they were a swarm of crickets. Incredible life experience. What many don’t realize is it’s possible to see the Migration all year round. 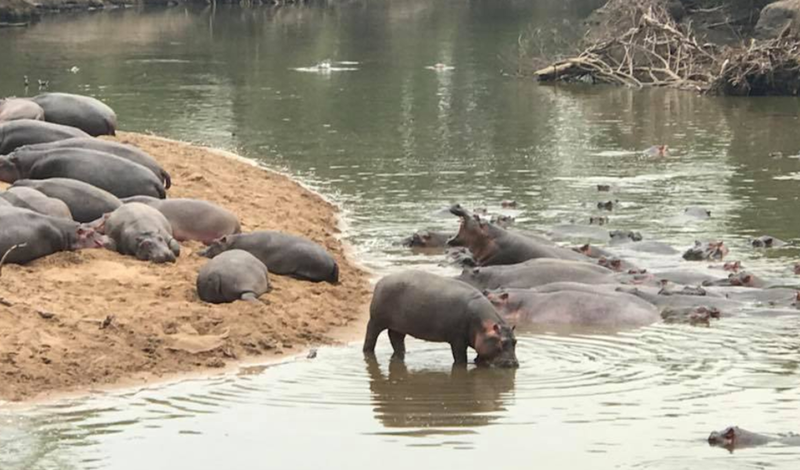 The river crossings are from July to November, the huge herds in Serengeti in April to June and calving season with babies and predators from December to March. I was looking for moments where all I could see was wildebeest everywhere I looked. It’s sad how after a couple of days you start rooting for the predators and are hoping a crocodile is in the water. One major myth is it being hot. We went in July and needed jackets some nights. It was NOT hot, the weather was hotter at home. If you were hoping to go before it became a major tourist destination, with major international tour companies, and fees like you were in a top park. Too late. The fees were quite disappointing. 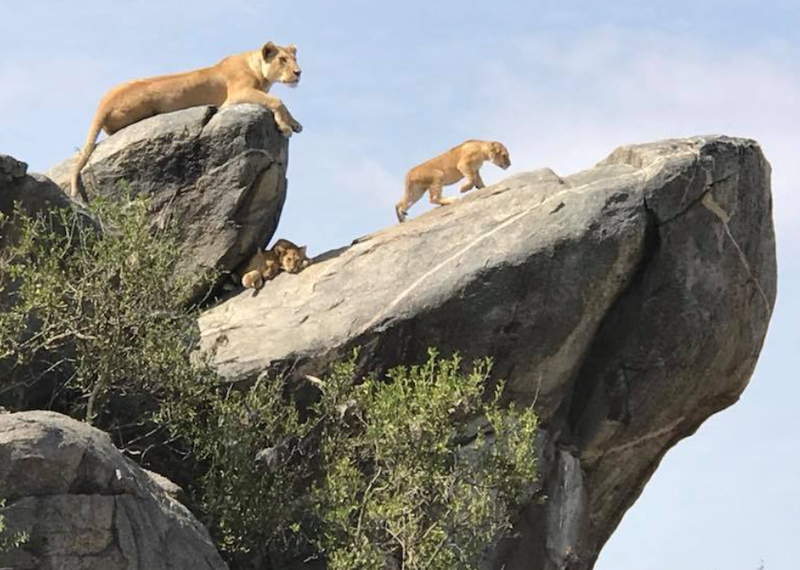 Tanzania knows that the Serengeti is a major international destination and getting accommodations in the park for less than $200 per night are nearly impossible. 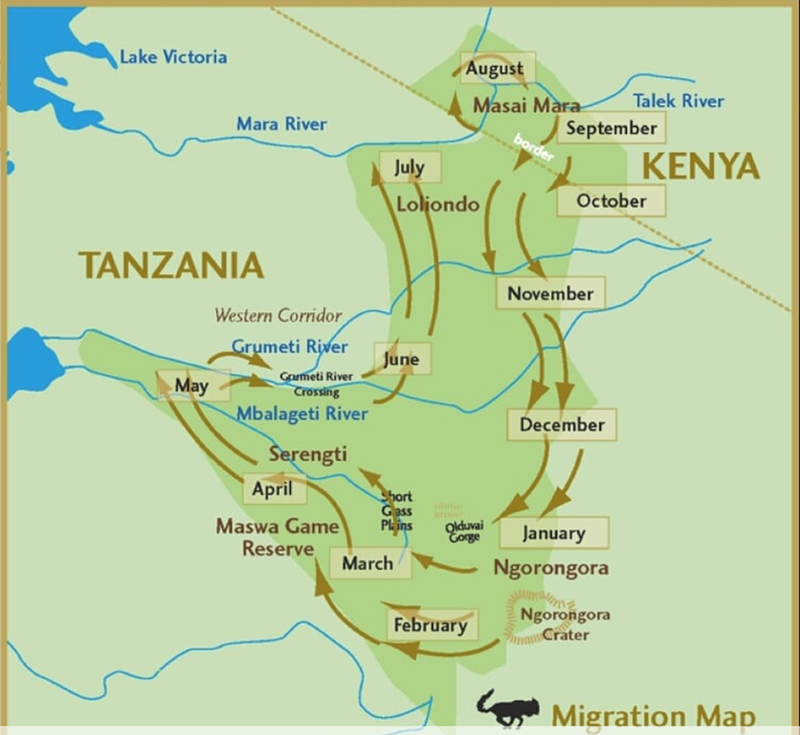 Just pulling up a random date the cheapest per night is $500 for the 28 properties near Serengeti. Go check booking.com… I’m serious! There are primitive camping options at around $150, but for the most part I found most accommodations are only accessible at reasonable rates only through tour companies. These companies seem to have a monopoly on the prices. If you’re thinking you’ll skip the tour and do the drive yourself after 5 days in the park I can tell you they’ve tightened it up so it’s next to impossible to do yourself. The park fees are $50 per person per day, but included in trip costs if you go through a company. The crater entrance fees $200 per vehicle. Let me get off the topic of fees. It’s not cheap, but please do your research. 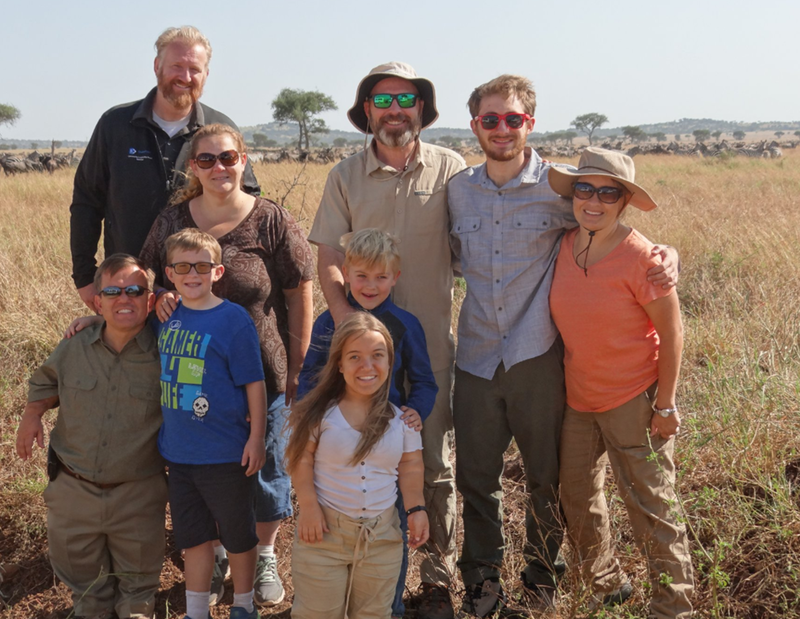 This can be an epic trip, and very worthwhile. It was two days into the trip that I found out from my driver if I went direct I would have had a better price, and here I thought I had the direct price. We must have priced out 30 or more different outfitters. I’ve seen prices commonly between 5K to 30K for a week for a comprehensive inclusive package. Ultimately there were 9 of us with my wife and our 9 year old, my brother in law and his son, and my other brother in law his wife and 2 kids. We elected to do 2 different big safari vehicles. 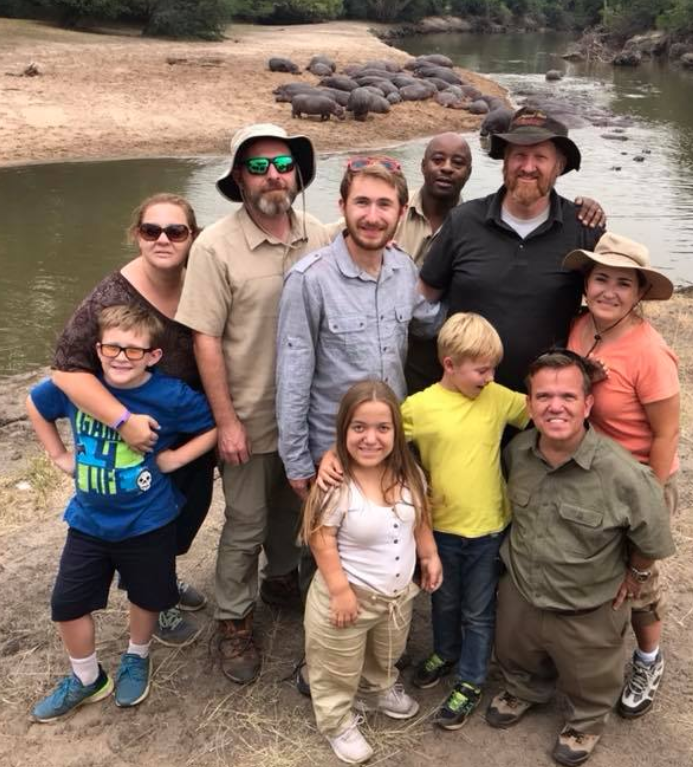 My African Safari family – In the back is our guide. Yes those are hungry hippos in the background. No they don’t have access to us there’s a 30 ft cliff behind us. viewing later check out of the park and drive to Karatu . 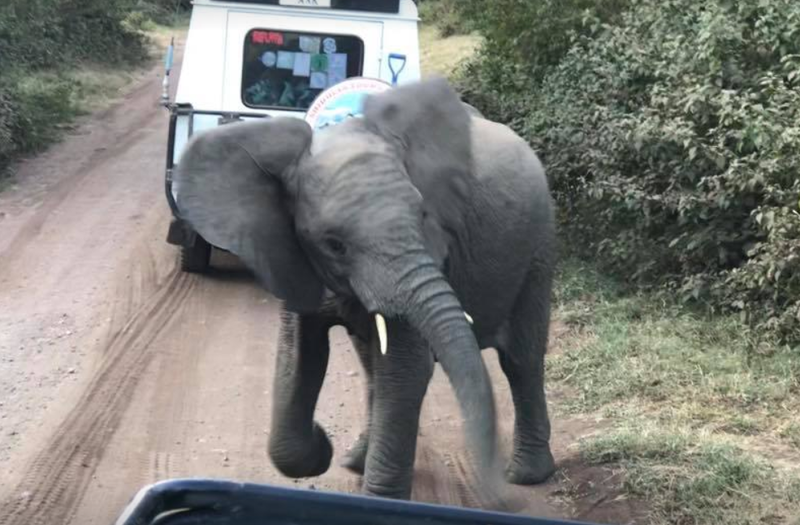 You never know when a young elephant might jump out of the forest and be a little upset that you cut her off from her mommy. Let me tell you… they aren’t afraid of cars. 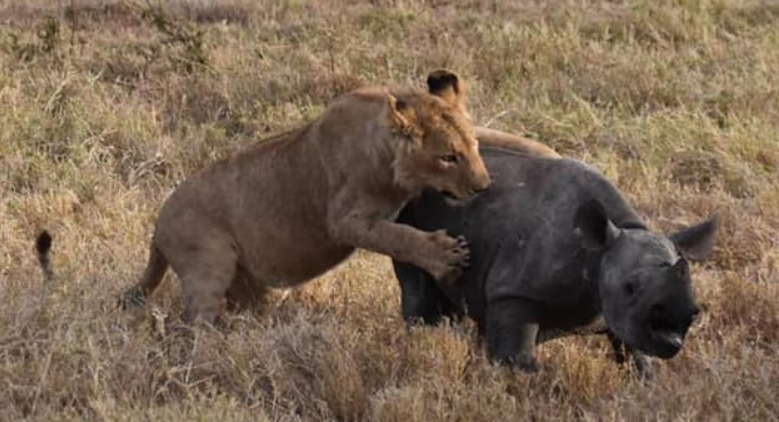 Of course you start tracking the big 5. The Leopards are beautiful. Driving nearly all day tracking animals went by quickly, and the sunsets were spectacular! Even better when a giraffe would pose. 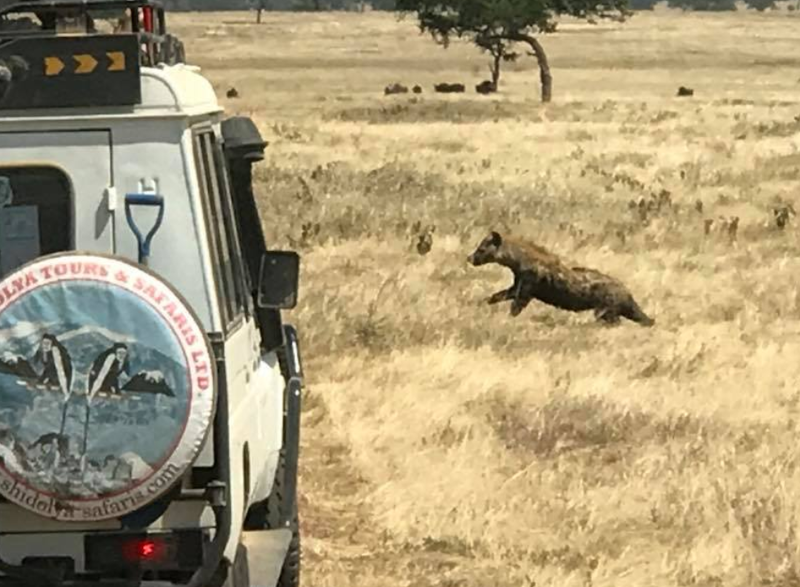 Spend this day with game drives within the Great Serengeti. Serengeti is the home to Africa’s Big Five. There will be picnic lunch. introductory game drive as you arrive at the crater as you head to the lodge. natural beauty ranks it among the most pristine wilderness on the earth. intact crater in the world. 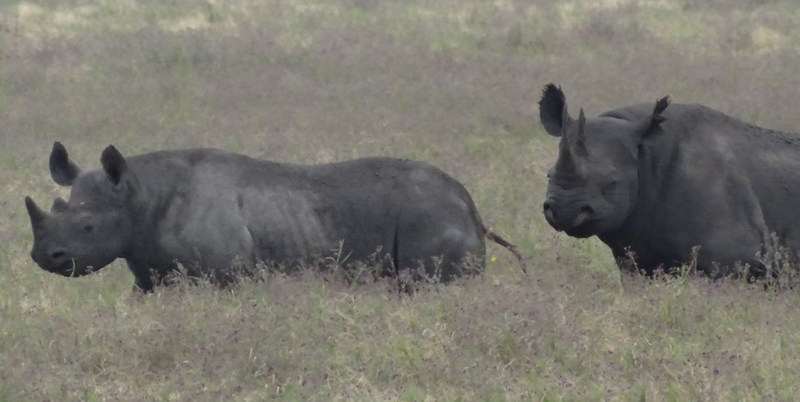 The crater didn’t disappoint on providing the illusive black rhino as well. 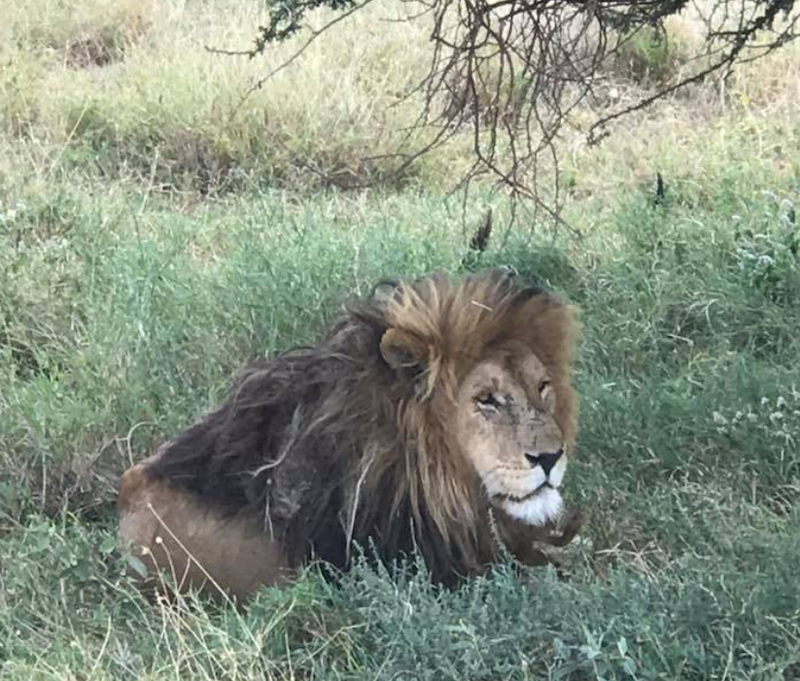 For the most part by day 5 we were already saying we’ve seen enough of the antelope, elephants, and we’ve clearly found the big 5. 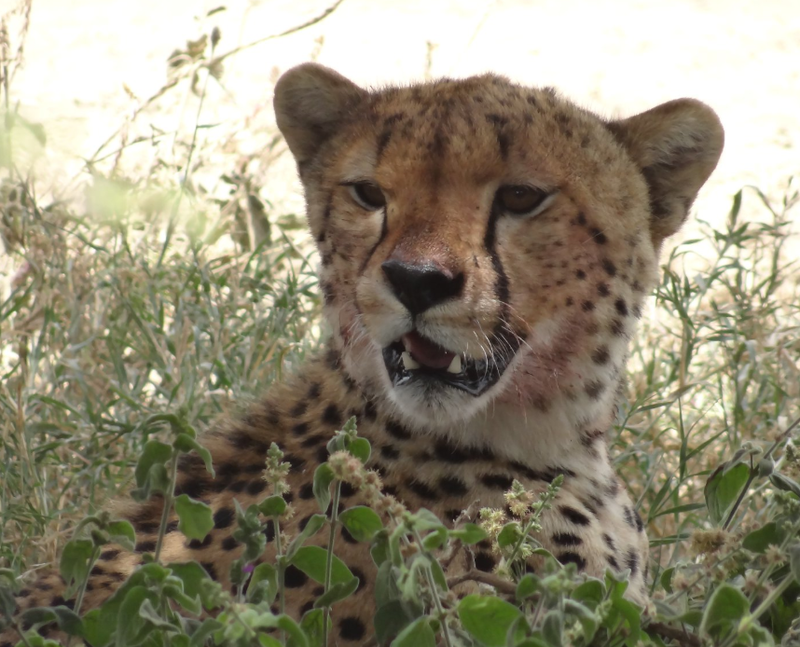 Let’s track leopards, lions or cheetahs and see them land a kill. 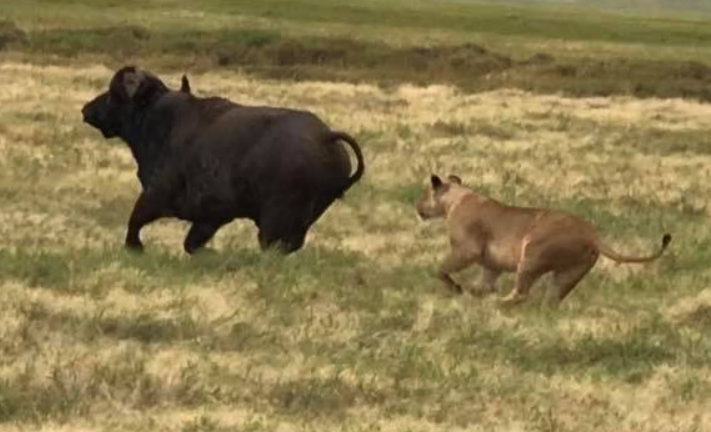 We weren’t disappointed, we caught a very interesting hunt of a four male lions tracking a female lioness who was hunting a water buffalo. 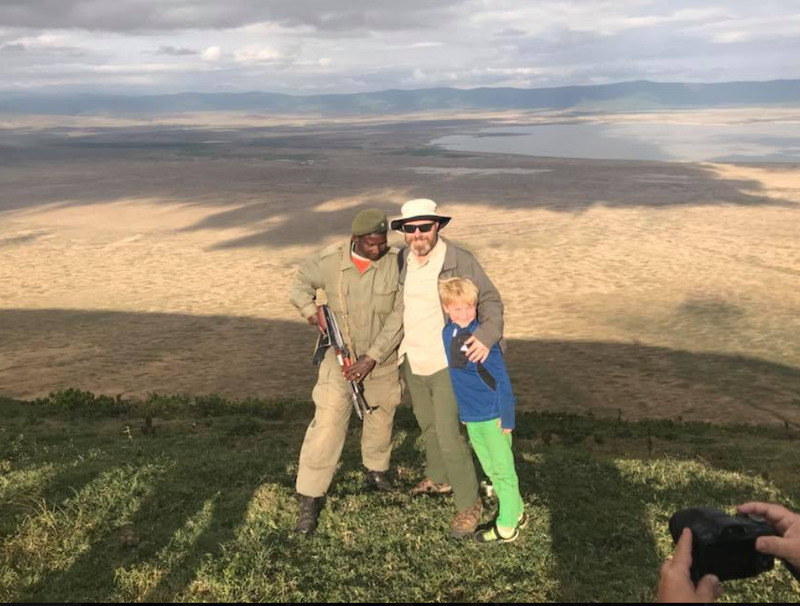 Day 6: Ngorongoro Crater – Arusha. After breakfast at the hotel depart and drive to Arusha. Drop off. No one told this young one she was in the wrong place. PRICE BASED ON USE 4X4 SAFARI LAND CRUISERS. So for my share it was around $3,785 for the 3 of us for 6 nights and 5 days all inclusive. Accommodation on Full board basis on safari. Of course the animals don’t know where the wild ends and the homes are. In fact most of the lodges we stayed at warned us not to wander at night. There were no fences around the camps. 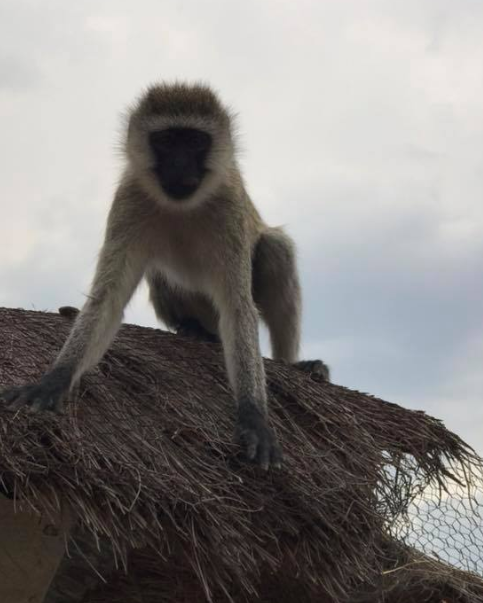 In most camps we had armed guards who stayed up late chasing off animals or potential predators that wandered into camp, but the monkeys didn’t care. Our vehicles do have the pop top which was extremely handy and we ended up using it A LOT! Make sure you bring a good camera. The photos you see in my blog here are all from an iphone. Imagine what they’d be with an SLR. 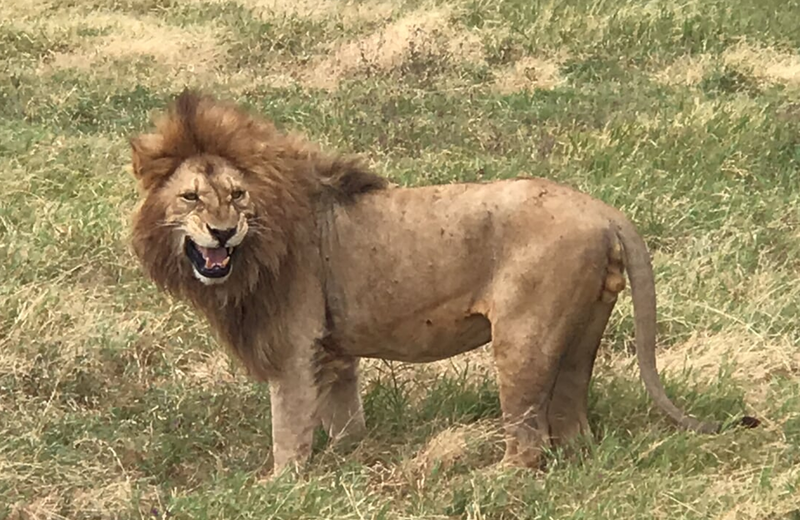 You do get quite close to the wild life and the exhilaration you experience when you see a lion chasing it’s game is incredible! 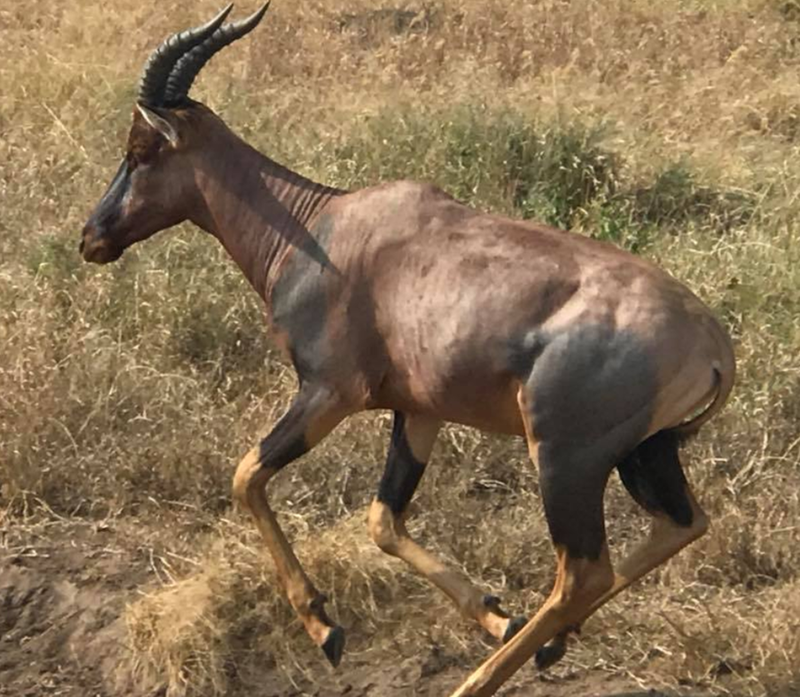 Africa has some incredible animals and to imagine them all in such a short distance is pretty mind blowing. 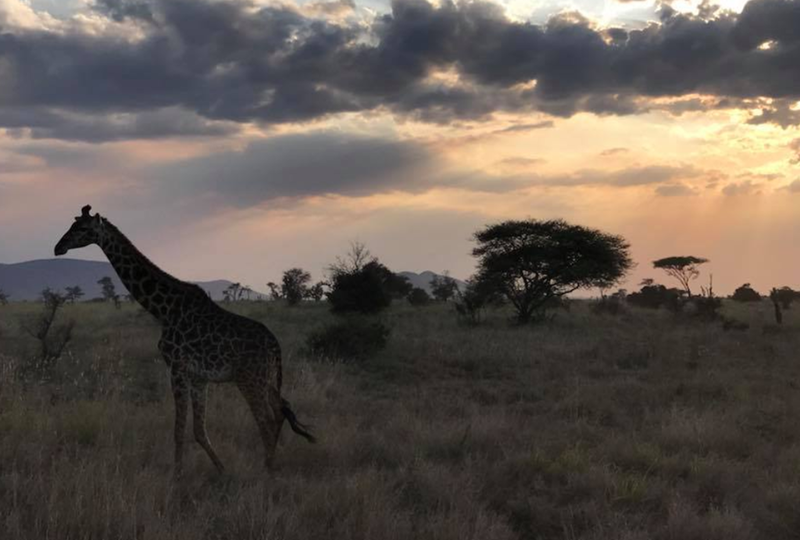 Don’t let the animals be the only reason you want to visit Africa. As a traveler the cultures of the tribes are easily what keeps me coming back for more. There’s so much we can learn, and increase in our perspectives by learning from each other. 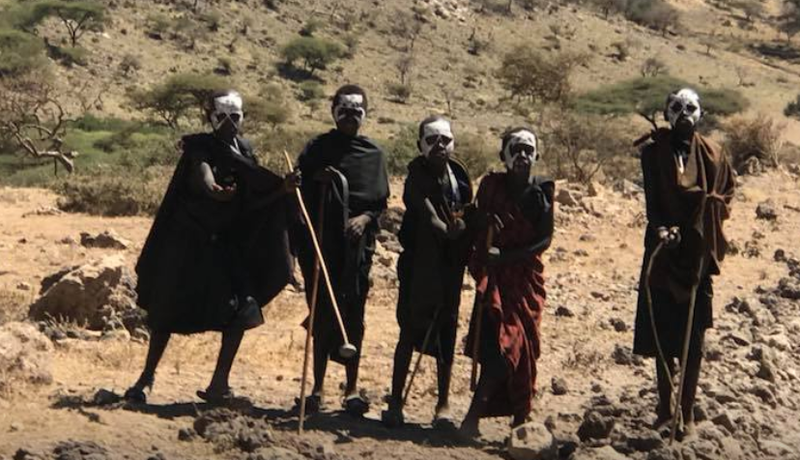 The Masai tribes were extremely welcoming. 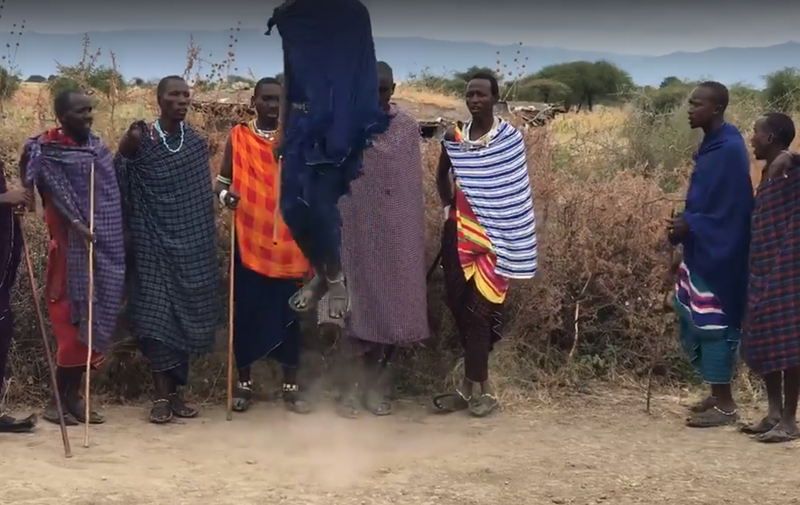 They had a very formal way of receiving us into their village, with traditional greetings, jumping and dancing, and showing us their arts and crafts and then taking us into their homes. It’s not without a price these days, but if you get past that part, it’s a fascinating journey and your funds are shared among the whole tribe. We were told our money was going to go for medicine for the cows. Having visited the school of the village, I was happy to share that and more. We left books and school supplies that we had purposely brought with us in extra bags. If you end up planning a trip something like this. I highly recommend what I call a detox in Zanzibar. Go relax in Zanzibar, go to the night markets and relax on the beach. There’s the best food of Tanzania is in Zanzibar. 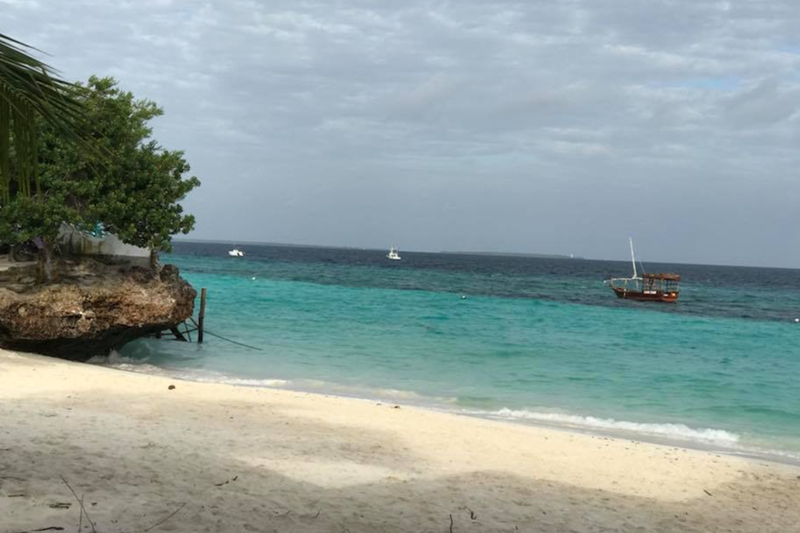 Very easy to find great food on the island, and the pace is perfect for relaxing as well stone town has some fantastic culture, history, and feels a little less like that extremes of tons of tourists or primitive… lots of great deals to be had on Zanzibar. I really enjoyed taking in the culture and spices of the island. I’m not selling anything. If you are curious who I used reach out to Edward Massawe I asked Edward how people can reach out. He says “Hello Joel! Jambo? Hope all is good with you my friend!! Here is my email address edwardtz@ymail.com, or WhatsApp me at +255 763 122 626.” He was our driver who said he could even do better direct. He recently posted on Facebook how he saved the life of a baby rhino with some other drivers. 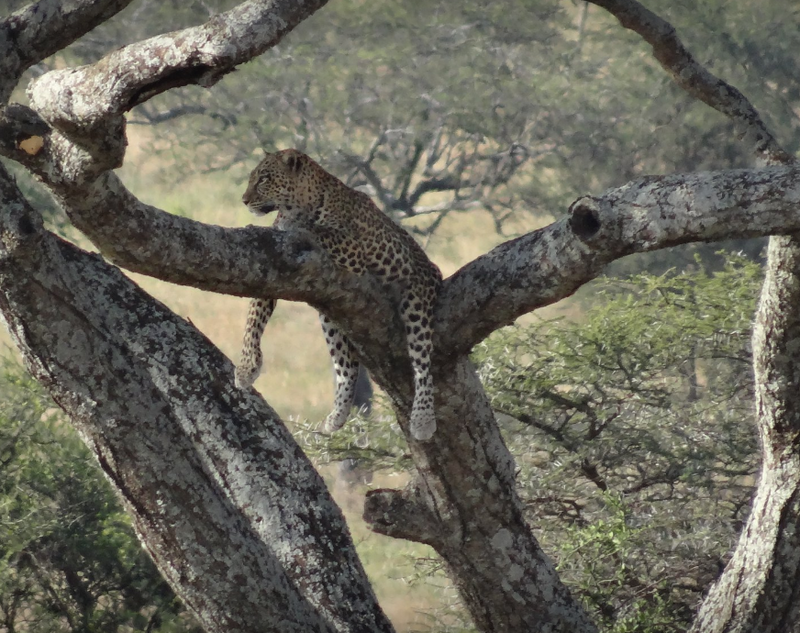 He’s got some fascinating tales from Leopards inside the vehicle… stories you’d never believe! I left off the story of the Kilimanjaro Ultimate Hike at the end of Day 4 as we were going to bed at 6pm. You should read that post before you read this one to really understand where we were. We had just retired to our hut, and you could tell people that had stayed at this hut were mental. It wasn’t unusual to see carvings all over the room of people who were out of their minds. Some would talk about how sick they were, others how they were hopeful, but concerned. These out of place carvings were all over the beds and walls, with stories of people from all over the world. It really was a very global moment. The Russians were down the Hall, the Japanese we had left behind at the last camp, and the Netherlanders were on their way down. It was actually the Canadian couple that were Bosnian immigrants really represented the mood of the camp. The wife was feeling great and couldn’t wait to get started, the husband on the other hand couldn’t keep anything down and was feeling awful. As I lay in bed, I wasn’t really tired. Yes, I was exhausted but my head was really hurting. I have had some really bad headaches in my life. In fact one such headache made me wonder if I had a tumor or brain hemorrhage. In my dream that night, I dreamt I died. This headache was nearly that bad. I had images of my head exploding on the mountain, but also thought about my son at home that had doubts that I could make it. If you’ve ever heard that Kilimanjaro was a mental hike… it really is. You have to dig deep and this was the night where the head game started. Before I fell asleep I went through my bags and took 3 Aleve and a few high doses of vitamin C. As well I took one more trip to the toilets. The toilets at Kibo hut are the worst on the entire hike. They really don’t want you to spend much time here. The turkish toilets (non western) were non flushing hole in the ground style latrine. They stunk and people who had been using them were sick… really sick. When I got back in my sleeping bag, I was cold. Really really cold. I felt like I was freezing and started shivering. I put on my thick socks and put on my coat which I had taken off. Even then I was still feeling cold and my neck felt like it had a kink in it. It was at this point I was starting to get a little worried. What if I can’t get any sleep and everyone wakes up in a few hours and I haven’t slept at all. I can’t do this hike with 2 days of no sleep, but I also can’t NOT do it. I felt like I had to put it all off and get out of the mental games I was playing with myself and after a little prayer I was feeling relaxed again and closed my eyes. What seemed like less than an hour later, the door was getting knocked on and I was closest to the door. It was our wake up assistant cook bringing in the hot drinks. No fresh water at Kibo. Only that which was hauled up from Horombo hut and boiled. My head was feeling some better and after eating a little something I started getting ready. I had heard it was going to get VERY cold. So I started putting on the layers, from the thermals, pants, to layers of shirts short and long, and then a rain coat which I’d shed in the first half kilometer. My snow coat was good enough for me, I actually had to open it a little to get a little relief. My hands were cold despite the gortex snowboarding gloves I was wearing. They weren’t the best gloves, but I had a second pair on my waist if I needed them. None of us bought the glove heaters. There were some for sale at the bottom of the mountain, but none along the way. I may have been tempted otherwise. After getting all our gear on, we gathered around for the details. It was midnight and we were starting day 5 nice and early. 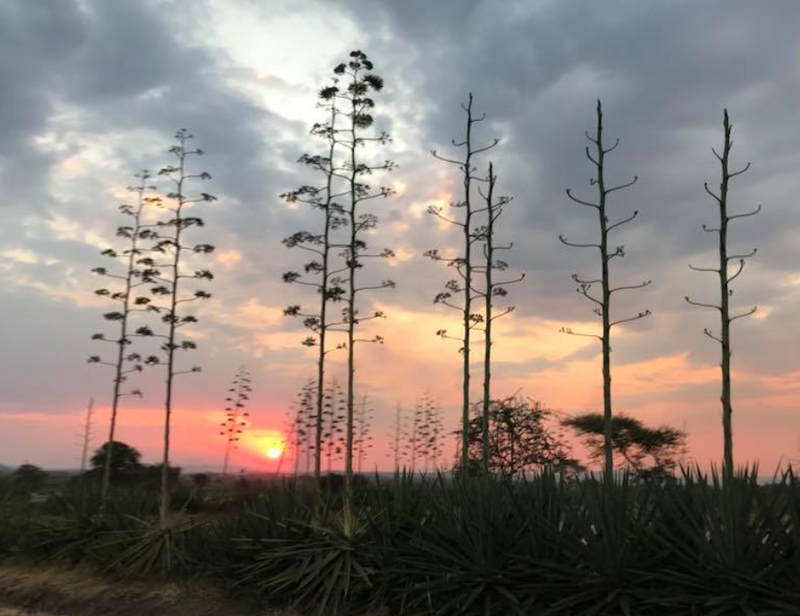 Our guide discussed that we would make it to Gilman’s Point by around 5 or 6am, and watch the sunrise from Uhuru, the highest point on Kilimanjaro. He explained there would be 3 of them for the 5 of us, which seemed different than what I had overheard another group say where there were 2 porters for every person. He did go on to explain our water would be frozen by 3am, and that they would be carrying boiling water in thermoses, and would get us water refills as we needed it after that point. After not hearing any details about whether we were ok or not, I asked him what the warning signs were and what was NOT ok like a headache? He explained that headaches are normal, even bad ones and that we shouldn’t be worried about a headache that goes away with medication. What we should worry about are passing out, dizziness, but even vomiting is ok. “Just vomit and you’ll feel better.” was his advice. After the great pep talk we all turned on our headlamps and headed out into the dark. The night sky was incredible. A foreign sky with unfamiliar constellations minus Orion. He stuck with us all night. Very comforting to Mark, as his son is named Orion. Polo, Polo something we had heard every day up to this point really sunk in. Slowly Slowly they would say in Swahili. This was the steepest trail we had experienced up to this point. The switch backs were long, and the rocks and bouldering we did was long. I never felt threatened at all. No jumping from rocks where I felt I might die, but I did feel sore and tired, and cold all night, but to keep that off my mind we sang local Tanzanian hiking success songs we had heard at camp, and we dug deep and sang Reggae songs. It felt very appropriate to sing our hearts out… “So, Don’t Worry, About a Thing… ‘cause every little things gonna be alright.” Bob Marley would be proud. I think the Bob Marley himself was listening to our prayer as only 2 nights later we would be greeted like brothers at a Rastafarian celebration in the fort in Zanzibar, but that’s another story. As we trudged slowly up the mountain, all of us kept our spirits up while some went a little quiet. It wasn’t unusual to see someone in another group as we passed, vomiting (so they’ll feel better). As well, there were some other unsightly smells and things we saw that were unpleasant that made hiking that much more challenging. Every couple of kilometers we would stop for a few minutes to catch our breath, get some new energy bar, or pure energy. Up we went, no plants, lots of dust, lots of dirt and rocks, with only our headlamps to light things in our path. As we’d look ahead we’d see strings of lights like a christmas tree with very visible switchbacks like the strings going back and forth on the tree. It also seemed like prison gangs trudging along in the night at an even pace. On this night we were determined to push ahead against all odds. All of us were going to make it, we were sure of it. Every so often we’d see someone heading back, with serious failure in their eyes. They were just so sick and in such pain. It tore at my soul. With Gilman in our sights the horizon was starting to change colors. The sun would soon be coming up. We pushed ahead and what seemed close was still much further away. It was important to focus on closer things than the top. The next big rock was a much better goal. After going from rock to rock to rock, we finally made it to the top of the mountain, just not yet the highest point. We had arrived at Gilman’s point. We stopped to take pictures and take in the view. It was incredible. It felt great. On the other side we could see the crater, and we could also see Uhuru, the ultimate destination and highest point of the peak. As I was taking it in, many in the group thought they could make it to Uhuru for the final sunrise shot. I wasn’t in a hurry and found Paul was of the same attitude. Why rush it? We have spent the last 6 hours getting to this point. Let’s enjoy the view, watch the sunrise and then push on. Gilman’s point started getting really crowded and after the other guys left, I encouraged Paul to push on a little further for a less crowded view where we could find a comfortable place to relax. We found a great place on top with a couple of strategic rocks. It felt great, and the sun definitely was warming things up. It had been minus 6 on the way up and the wind chill made it feel like minus 20. The two hats I was wearing up to that point weren’t enough to keep my ears warm, so I was really welcoming the sun. 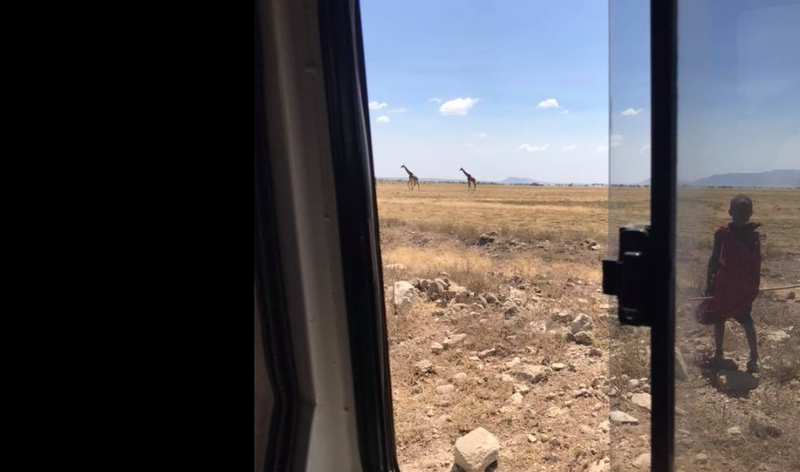 We could see all the way to Kenya and I imagined the animals roaming around the Serengeti in the distance. (Not suggesting I could see anything, but our friend John was down there or at the crater… somewhere). After a break, and having some prodding from the assistant to the assistant guide try to convince us to move on, we finally were ready and had what it was going to take to get us to the top, but what we were about to see I wasn’t ready for. As we moved along the top now at over 19,000 feet, I had seen and heard individuals along the way crying and digging deep, but I hadn’t noticed until now that between two porters I would see a person… limp, and often the eyes rolled back and barely a little bit of life. I had heard of temporary blindness, and dizzyness, but what I was seeing was scary. There were some people traveling along the trail that didn’t seem human. They must have committed their guides to take them the rest of the way, or the guide must have felt the hike was that important. Either way I was seeing people feeling the elevation in pretty serious ways. Days earlier I had seen a stretcher being run down the mountain at top speed with the person’s face looking reddish purple. Now I was seeing people that were nearly passed out and barely walking. I’m so glad none of us got into that state. It was cool to see our guides and porters taking anything we wanted to give them, from packs to coats, and such. 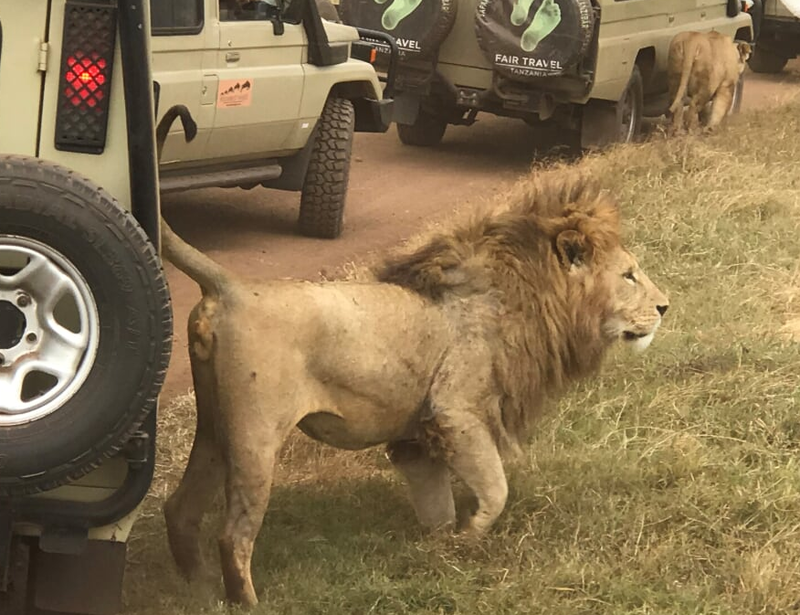 It was on this leg that I most appreciated everything that our Guide Daudi had done for us. He had set a pace that really paid off on this day. We knew that pace and all crept closer and closer. Paul and I finally caught back up to the group and kept trudging along. A couple of hours from when we left Gilman’s point we were at Uhuru the top of Africa and the top of the highest free standing peak in the world. As well, it was all of our highest peaks by thousands of feet and all of us felt incredible. At the peak at Uhuru at 19,341 ft (5895 m)! The way down was painful, but I’m not going to be as wordy. After we arrived at the top, I laid down for a little nap. 30 seconds into it, I got yelled at. You can’t sleep! Not at this elevation. So I sat up. No, get up! They didn’t want to see me laying down at all. I think they were worried I would turn into one of the zombies. On the way down, the pace wasn’t as important. No polo, polo was shouted out during the descent. In fact I think they appreciated that we wanted to get down. Getting back to Gilman’s point took half the time, and after that point, the world was changed. It was no longer dark. It was light. What we saw were strange sights. The strangest thing was all these switch backs took on new meaning. We didn’t have to honor them. We could simply dirt ski or slosh through the sleuss. The dirt, rocks could almost be parallel skiied through. The style was to slide and push ahead with each foot and lift at the end and start again. It was a lot of fun actually for a while until my right knee really started taking on the stress. It was getting painful and even trying to do the switch backs didn’t offer relief. It was a steep trail and my mind was made up to simply get back to Kibo in hopes of getting a nap in. After a couple of hours of dusty rocky dust clouds of sluess we made it back to Kibo and were greated with our first and only flavored drink. Tang! The drink of champions. It tasted great. Then we took off our boots and relaxed. It felt great. In two hours we were back up and told the beds were no longer ours and that we’d sleep in Horombo. Yes, it would be the longest day in my life. Another 7.5 miles after what I just did… 10,000 feet (5000 up and 5000 down) was what I had just done, and how I’d do another 4000? I didn’t push back too hard. I knew it was part of the plan. After the nap, I took two of Mark’s magic 800 MG IBU profen hoping to take away some of the pain in my knee. 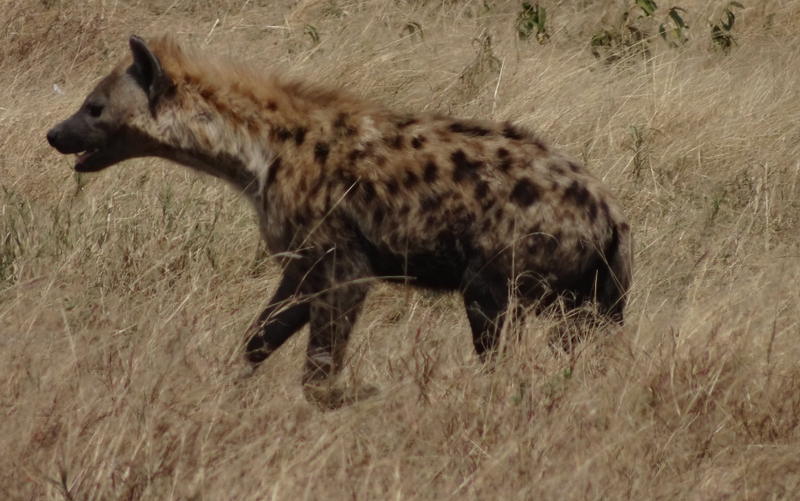 Below: Kibo at midday. We were in the stone hut on the left. Another 4-5 hours and we were back in Horombo… our home away from home. That night 3 of us didn’t get up for dinner. Popcorn, cucumber soup, and spaghetti with vegetables in red sauce sounded awful. Two showed up for dinner and they made grilled chicken… the only night they had it. Who was the mystery mountaineering company? 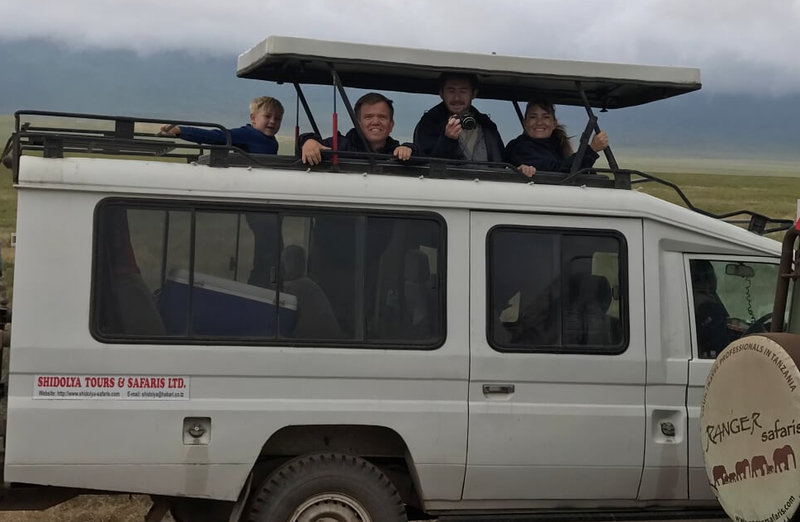 We went with Ultimate Kilimanjaro, run locally by Zara Tours. Thanks Colligo our SharePoint iPad app sponsor. Their help it made this possible.